HEAR THEIR THERE HERE is a site-specific sonic art work, an interactive audio guide for the “here and now.” It is a playful sound-walk through Brooklyn Bridge Park that is at once ordinary and extraordinary. Over many months, the creators recorded the observations of hundreds of voices in Brooklyn Bridge Park. Using the geo-location capability of your phone, the app lets you, the listener, hear their words where they said them. Part documentary, part chance operation, HTTH follows you where you go throughout the park. Your choice in direction and duration tell the app what to play, so there is always something new to uncover and listen for with each experience. You will never take the same walk twice. • “Hear Their There Here” runs in the background on your phone. If you no longer want to experience the app, double-tap the home button on your phone and swipe the app’s card off screen. The app should then quit. • If you’d like to pause the app, swipe up from the bottom of your screen to reveal the control center. Swipe left to reveal the media controls and press the pause icon. Press play to resume. • If you’re having trouble detecting your location while using the app, make sure that you’ve enabled location services and given “Hear Their” permission in the Privacy section of your Settings (Settings->Privacy->Location Services). If you’d like to be able to lock the screen to save your battery, make sure the app is set to always have location access. • If you’d like to leave feedback or submit a bug report, please visit our website or just click the “feedback” link in the info panel in the app. After you’ve taken your first walk, please help our development continue by taking this survey. 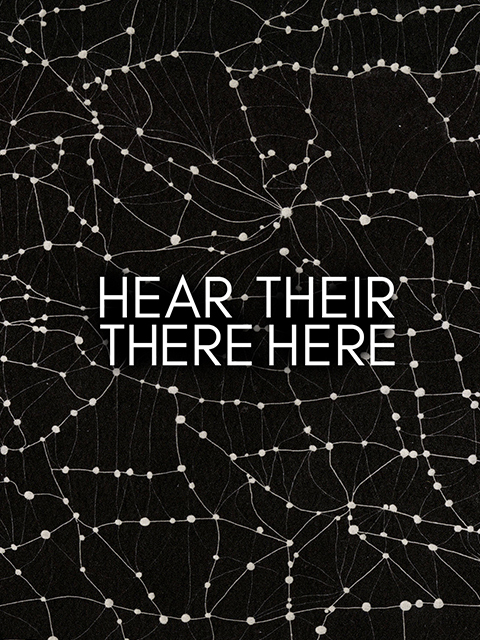 HEAR THEIR THERE HERE was commissioned and developed by St. Ann’s Warehouse; created by Geoff Sobelle, sound-designed by Gareth Fry, app designed and developed by Jesse Garrison, artwork by Victoria Burge. Additional assistance: Sheelagh Darling, Rae Binstock, Ben Grant, Harry Johnson, Mike Winship and Eben Hoffer. This sound-walk reflects the musings and opinions of everyday people, not factual accuracy.